The World Health Organization recommends that infants should be exclusively breastfed (EBF) until 6 months of age as this practice has been shown to have multiple beneficial health effects. These include reduction in morbidity and mortality of acute diseases as well as reduced long-term risk of chronic conditions such as diabetes and obesity. Recently, the gut microbiome has emerged as a key mechanism by which breastfeeding seems to impart such diverse health benefits. However, studies reporting changes in gut microbiome composition between EBF and non-EBF infants have variable results, likely due to differences in experimental design, data analysis strategies, populations and other factors. In our meta-analysis published in Nature Communications, we synthesize data across multiple studies to provide a robust and comprehensive view of the “big picture” as well as perform in-depth analyses to reveal novel findings that can elucidate potential mechanisms for the benefits of EBF across different populations. Our study shows that gut bacterial diversity, gut microbiota age, composition of Bacteroidetes, Firmicutes and microbial-predicted pathways related to carbohydrate metabolism consistently increase while pathways related to lipid, vitamin metabolism and detoxification consistently decrease in non-EBF vs. EBF infants ≤ 6 months of age. In cesarean-delivered infants, bacterial pathway perturbation associated with non-EBF is more marked and involves different cellular and metabolic processes than in those delivered vaginally. In addition, we show that the effects of EBF persist after 6 months of age. Intriguingly, longer duration of EBF is associated with an increase in composition of Bifidobacteriaceae and a decrease in diarrhea-related gut microbiota dysbiosis. We speculate that a more stable, less diverse gut microbiota, associated with EBF, may be necessary in the early months of development. Our findings also shed light on the role of gut bacteria in mediating beneficial effects of EBF both short-term (e.g. reducing diarrhea morbidity and mortality) and long-term (e.g. reducing the risk of obesity and diabetes) especially in cesarean-delivered infants. Undertaking this meta-analysis required us to overcome several challenges. First, differences in study design (e.g. longitudinal, cross-sectional), experimental protocol (e.g. amplicon region, PCR and sequencing design), and data analysis (e.g. preprocessing and filtering strategies, OTU picking versus raw sequence reads) necessitated a unified analytic approach and “flattening” of the data to be directly comparable across studies. This is a known issue in 16S rRNA amplicon-based microbiome studies. Second, although quite a few microbiome meta-analysis studies have been done, none have addressed overall pooled effects for between group comparisons (e.g. overall comparison between non-EBF vs. EBF across studies in our context). 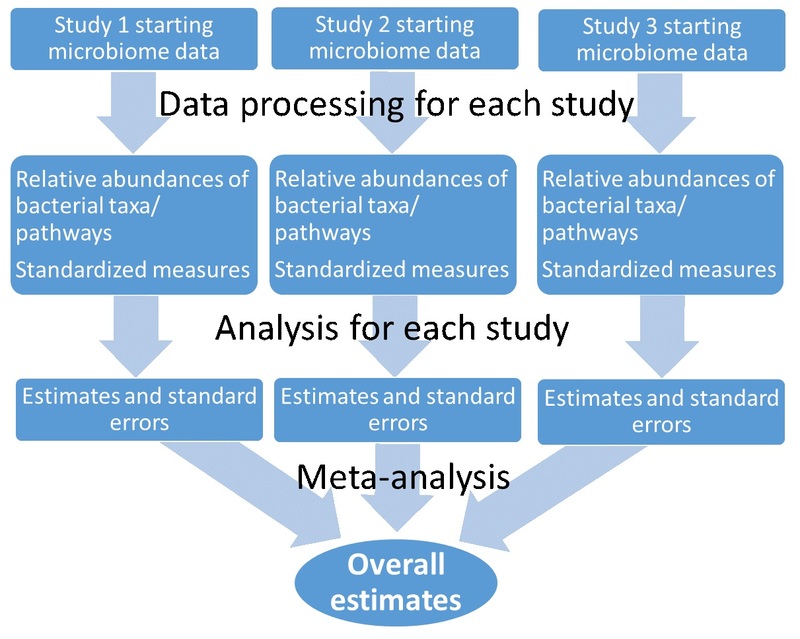 Therefore, we applied and implemented a method for analysis of relative abundance of bacterial taxa and pathways that allow handling of proportional data and accounting for the inflation of zero values, flexibility for different study designs (longitudinal, cross-sectional) and adjustment for confounders. Next, the meta-analysis approach that we applied is based on the comparable estimates across studies and allows examination of study-specific effects, the heterogeneity between studies, and the overall pooled effects across studies. Finally, much effort was spent building the collaboration and we appreciate the generosity of the groups who shared their pre-publication data for the purposes of meta-analysis as well as to demonstrate that this approach would work on extremely diverse data sources. We hope that making all of our analysis code publicly available via Github will encourage further collaborative efforts to utilize the plethora of microbiome data that have already been generated. Summary of our methodological approaches. This blog was written by Nhan Thi Ho and Fan Li with help from Louise Kuhn. Nhan Thi Ho proposed and undertook this work while being a Mervyn W. Susser post-doctoral research fellow at Gertrude H. Sergievsky Center, Columbia University, New York. Fan Li is a senior Bioinformatician in the Department of Pediatrics, University of California Los Angeles, California.